The last couple of months have shown that winter wasn’t just coming, it was here and hell-bent on freezing the behinds of every Sydneysider. 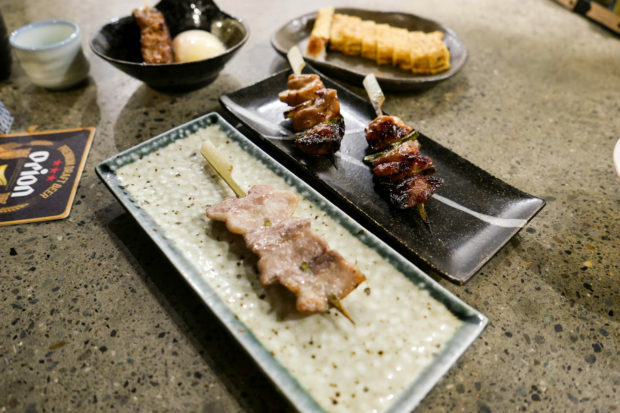 But aside from your usual comfort foods of soups, stews and ramen, taking a trip to your local yakitori den also works as a keep warm tactic. That’s exactly what we did back in July when the good guys at Yurippi in Crows Nest invited us to try some of their menu offerings plus new chilly weather specials. The menu at Yurippi is super easy to read. 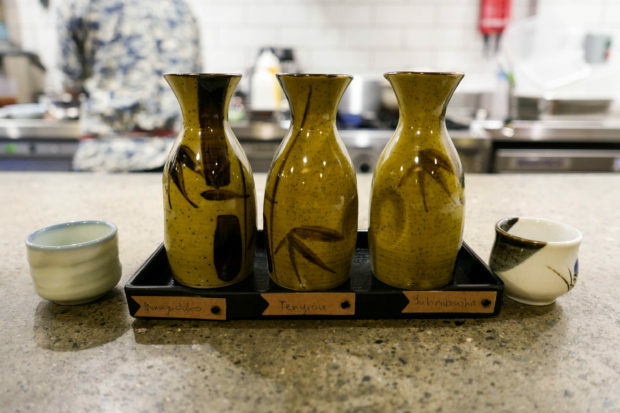 There are three main sections sorted according to price; Yakitori at $2.90 each, Special yakitori at $4.90, Seasonal Sides at $4.90 each and a little Desserts section at $3.90 each. 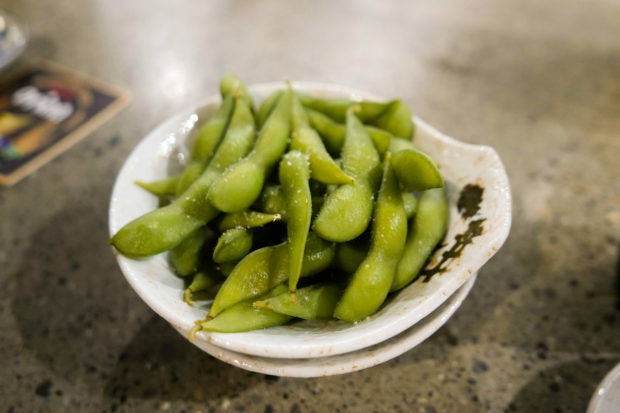 Edamame ($4.90) is a stock standard on most Japanese menus. It’s such a great snack to munch on and in my opinion are the better companion to alcoholic beverages compared to mixed nuts. Yurippi’s rendition had them boiled with pink salt, simple and crunchy. Cabbage might not sound all that exciting but I was loving the yamituki cabbage ($4.90) here doused in sesame oil. 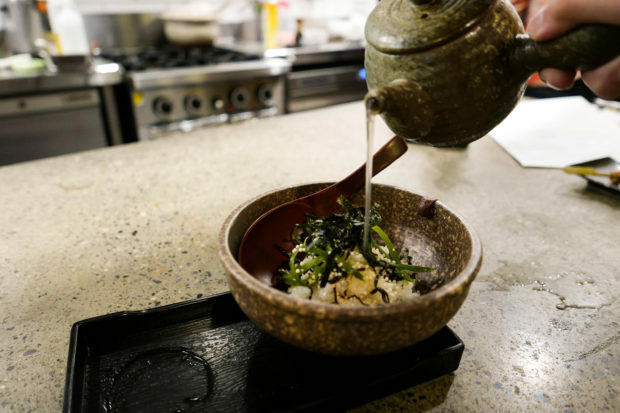 The savoury kombu was also truly addictive and brought to life the natural sweetness of the cabbage. 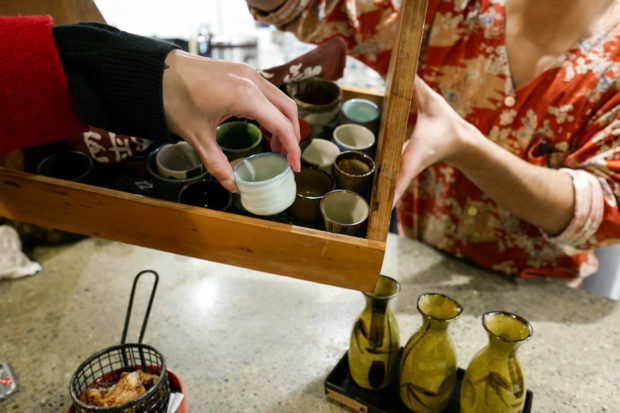 At Yurippi you get to pick your sake cup from a selection. There are some really cute ones too! Neither of us that dined that night are huge sake drinkers but we both liked themanagudako (junmai) sake the most which hails from Akita Prefecture. It wasn’t too dry and had some fruity notes to it which made it easy to drink for us sake novices. 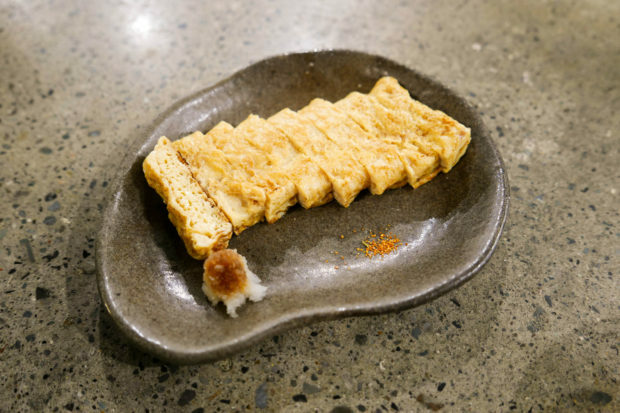 Dashimaki ($4.90) or tamagoyaki, is a Japanese omelette cooked with sake, mirin and dashi broth. This was not as fluffy as what we’ve had at other Japanese restaurants but it did have a very pronounced umaminess that’s characteristic of dashi. Chicken thigh and shallot ($2.90) was quite tasty with a generous amount of sauce coated on the skewer. Nothing mega outstanding but good enough. Pork belly ($2.90) up front lacked the golden hues that the chicken skewers had but according to my dining partner it was still delicious with a good ratio of meat to fat. In the background is a tsukune or chicken meatball ($4.50) which came with a 63 degree egg that doubled up as sauce. Tsukune is my favourite skewer of all time at yakitori, happy to report that Yurippi’s was nothing short of awesome with a great textural play in the mince. You’d also be surprised at the number of restaurants that don’t have the magic ‘firm yet runny on the inside’ egg to go with it! 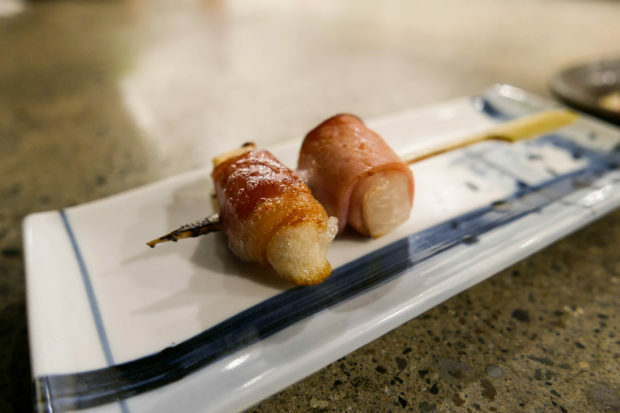 Mochi wrapped in bacon ($4.50) was a surprisingly good combo according to my dining partner. The mochi was fabulous as it had somewhat slightly crunchy outsides with a very melty and gooey inside. The bacon was the perfect salty kick to accompany it. Scallop ($4.50) was a happy marriage of sashimi grade Hokkaido scallop with kombu butter and kombu bits on top. I would’ve liked the scallop to be slightly more on the rare side so that the innards would still be bouncy. However kombu has reigned again here providing a kickass saltiness that compliments seafood oh so well. 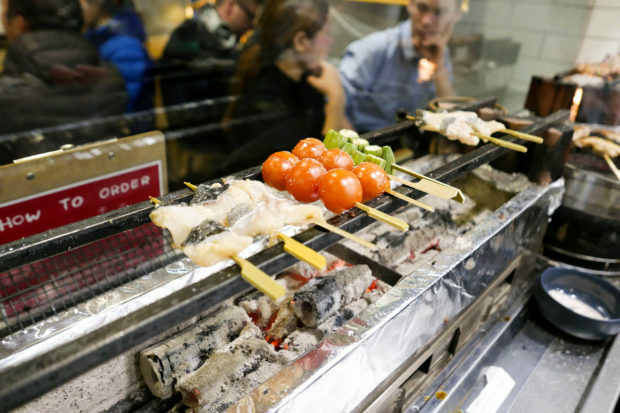 If you like dinner and a show, ask for a seat right in front of the robata grill. Not on our menu that night but I’d love to come back and try the miso sake black cod and cherry tomatoes. Moving into mains now is a winter special oden. They come at $2 per piece but a set of 6 pieces would only set you back a mere $9.90. This incredibly humble dish is what I’m here for, hot pot-like ingredients simmering in a simple dashi-based broth. 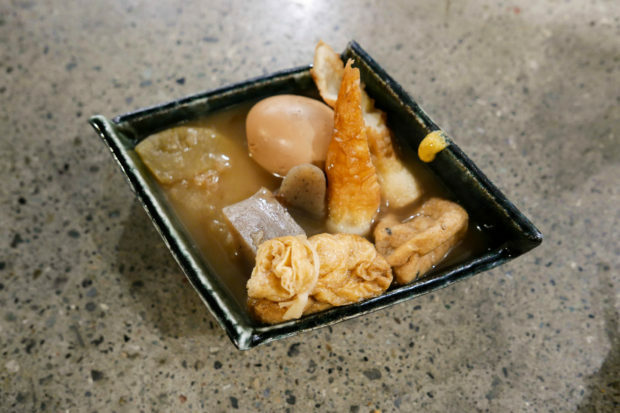 Oden is quintessentially winter in Japan for me as it invokes memories of cold days keeping warm at the local Family Mart or Lawson’s that has a pot of oden simmering at the counter that you can help yourself to. Yurippi aims to capture that moment as well as weekends will see them offering the same selection where you can fish your own favourite pieces out. Clockwise from the top: egg, chikuwa (fish cake), mochi kinchaku (mochi in fried tofu), ganmo (tofu fritter), konjac (yam cake) and daikon (Japanese radish). Last but certainly not least is the chicken broth chazuke. 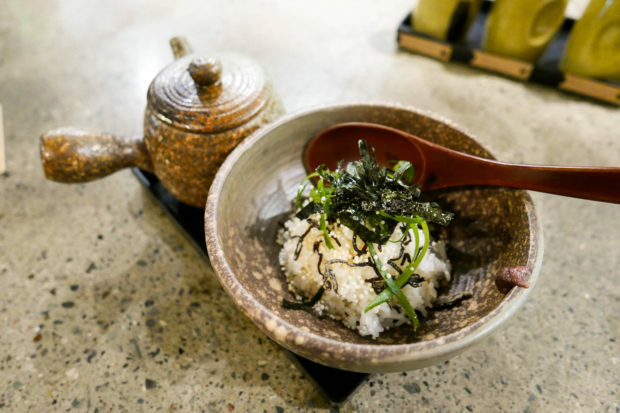 This was another simple but perfectly executed dish which consisted of rice, chicken stock, kombu, shallot and ume shiso sauce. Very warming for winter and the perfect end to a course of dinner dishes. To finish was a tart scoop of yuzu sorbet ($3.90). 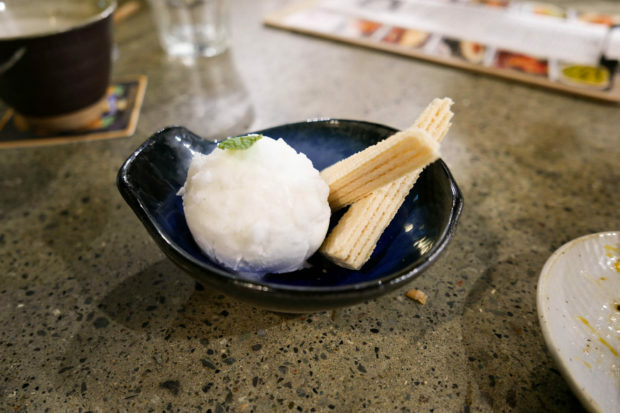 I love Japanese desserts as they are often not too sweet or too heavy so it is possible to fit this dessert even past stomach explosion point. Yuzu is one of my favourite sour flavours so this was super agreeable to me, so much I didn’t feel that I needed to touch the wafers. Just more sorbet please! 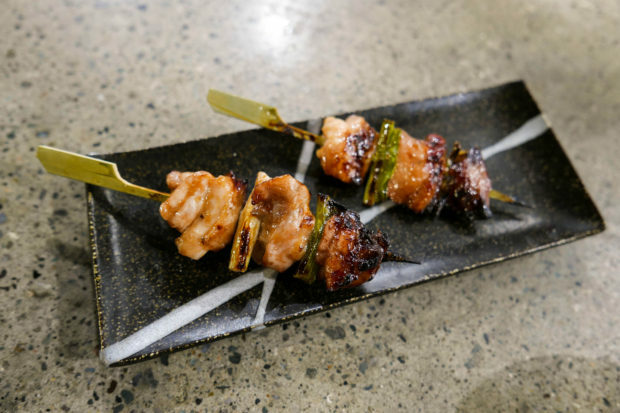 Yurippi is a strong contender for yakitori. 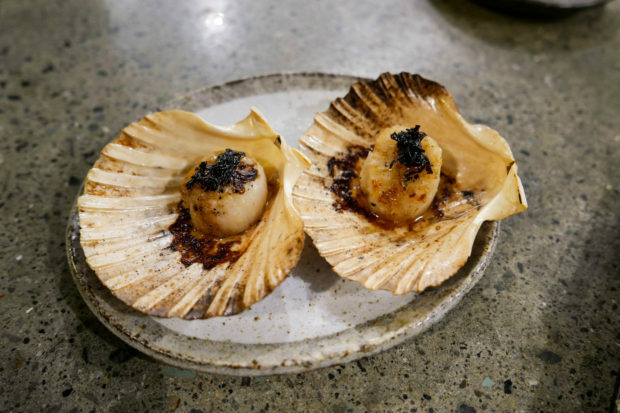 While it may not have the big punchy flavours that some of the other places in Sydney do, it’s great for simple and casual fare. 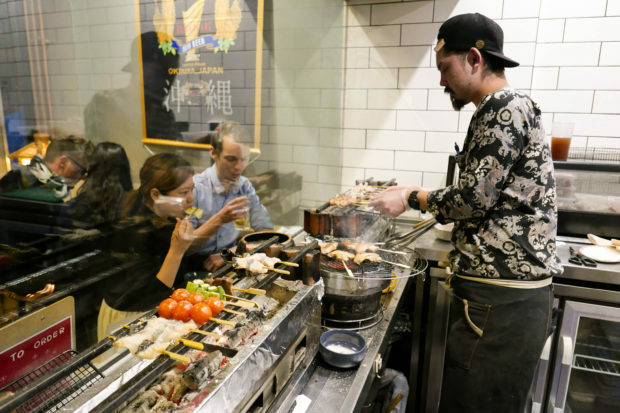 Coupled with uncanny 90’s J-pop music and friendly staff, you’ll be stumbling out of Yurippi feeling like you’ve just left Shinjuku and entered North Sydney.